On December 13, 2012, my wife and I watched a Greek tragedy, “Trojan Women”, which was written by Euripides (circa 484 – 406 BC) at Tokyo Metropolitan Theater in Ikebukuro. This play was directed by Yukio Ninagawa who, at 77 years old, is one of the leading Japanese play directors, producing a wide range of performances from contemporary Japanese plays to Shakespearian, Greek and Chekhov plays. As Ninagawa has remarked on the Internet, “the play is both ambitious and interesting”. Let me elaborate on this point. The play is unique in that the actors are from Japan, Israel and Arab countries. Which language do they use? Surprisingly, they perform in their own languages. Contrary to any concern for this, I did not find it so awkward due to the help of translation displays (in Japanese) on the stage sides. Such an experiment seems to be working, and is especially effective in conveying a message of global nature. The well known story goes something like this: Troy and Greece were at war and the latter finally won by using “the Trojan horse”; the Trojan men were all killed without exception; and the women who were deprived of everything would be spared but only destined to become slaves; finally the women watched the total destruction of their city before boarding Greek ships to their desperate destinations. Incidentally, this play is a joint endeavor by Japan and Israel, so after the performance in Japan, it will be performed in Israel. I hope it will capture the minds and thoughts of Israelis. I have no idea about the details of this performance; for example to what extent the Japanese actors will take part or not. Perhaps, the Japanese actors can participate as kind of coordinators to Israeli and Arab actors. 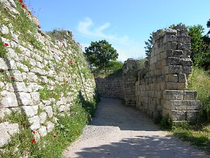 This is Troy today, which is located south of the Dardanelles strait in Turkey.